The Perfect 10 was among the superstars who have asked to be released since the start of the new year. With a multitude of options in the pro wrestling world like Ring of Honor, New Japan Pro Wrestling and All Elite Wrestling, several WWE superstars like Hideo Itami and Tye Dillinger who felt like they were being underutilized asked for and were granted releases from the company. Peyton Royce, who is in a relationship with Dillinger, recently discussed why Dillinger asked for his release from WWE on Chasing Glory with Lillian Garcia. NoDQ.com carried a report on the news. 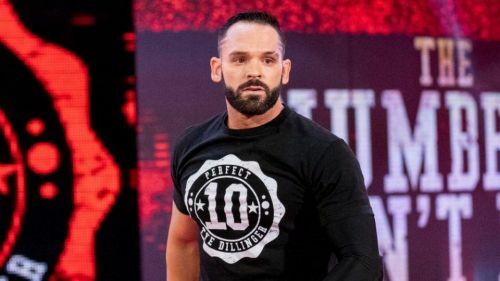 Tye Dillinger had been in WWE Developmental for almost a decade, but he caught on with his 'Perfect 10' gimmick. It netted him a call-up to SmackDown and even an appearance at No. 10 in the Royal Rumble, but after feeling misused, he asked for his release earlier this year. While Dillinger was extremely popular in NXT, having success in NXT doesn't always translate to the main roster. Superstars like Tyler Breeze, the Ascension and Sanity had good runs in NXT but haven't been booked as anything special since joining the main roster. Royce and Dillinger met while both were in NXT and both became a part of the SmackDown roster last year after WrestleMania 34. Royce described a conversation she had with Dillinger regarding his asking to be released from the WWE. Royce ultimately supported his decision because she cared more about his happiness rather than how far he would go in the WWE. Dillinger, along with TJP and Hideo Itami, was released earlier this year in what might be the first of several roster moves made by WWE. In the relationship between Dillinger and Royce, Royce has already accomplished more in WWE after she and Billie Kay of the IIconics captured the Women's Tag Team Titles at WrestleMania 35. Dillinger is already making appearances on the independent scene and will likely end up with his friend from developmental, Cody in All Elite Wrestling.